The single storey building to the right in the foreground housed the fire engine in 1908, before then it served as the village lock up. In the Vestry minutes of 1834 when it was reported that "the dark hole was very insecure, persons having escaped during their confinement", it was agreed to have the building redesigned by William Flint, a renowned Leicester architect, to accommodate the lock-up, house the fire-engine and "also a place to lodge poor persons upon travel". In 1920 the Quorn Urban District Council received a petition against the proposal to turn the old lock up into a public lavatory. Despite this, the building was used as public conveniences until 1963. More recent users have been the Gas Board and a pizza takeaway business. 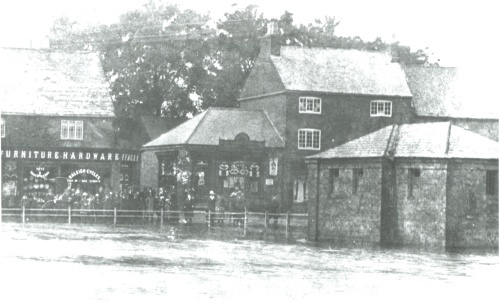 Facer's hardware and furniture shop on the left of the photo was formerly known as the Hall on the Green and was the property of the Farnhams of the Nether Hall, who used it as a dower house. The windows used to contain several shields of stained glass representing alliances of the Nether Hall Farnhams. In 1854 a Reading Room and Library were established in the building and in the 1870s it was used as a Convent for the Blue Sisters. Despite strong opposition from several parties, including Loughborough and District Archaeological Society, the Hall was demolished in the 1960s and the current row of shops including the Post Office was built in its place.